Last fall our church called for volunteers to help grow their youth group. Nathan, and his brother and his wife and I volunteered, hoping to give back an ounce of support for everything the church has done for Nathan and his family over the years. Newly renewed ‘regular church goers’, it is nice to be involved again. We work primarily with the middle school youth, which includes aging activities such as lock-ins and bowling. Today we took them on a bike trip, to a trail about an hour from here. The trail is an old railroad. A van takes you to the top (the preferred route, at least, for non-biking folk) and then you basically coast the 17 miles back down to the way to the bottom. The trail was pretty rough today since it is so early in the season, and there were heavy rains on Friday. We had a great time…but I can say there are certain parts of my body that are not so used to a bike seat. …yep. Yesterday I had a challenging 3.5 mile run. The temperature was in the mid-50s, but the wind chill was about 40, I dressed for about 45, and was clammy-warm when the wind wasn’t blowing, and freezing when it was. Needless to say, it wasn’t my best running performance to date, but I try to not be hard on myself – everyone has ‘off’ days! Confession time: I LOVE chocolate chip cookies. And I have a number of awesome gluten free/vegan chocolate chip cookie recipes. 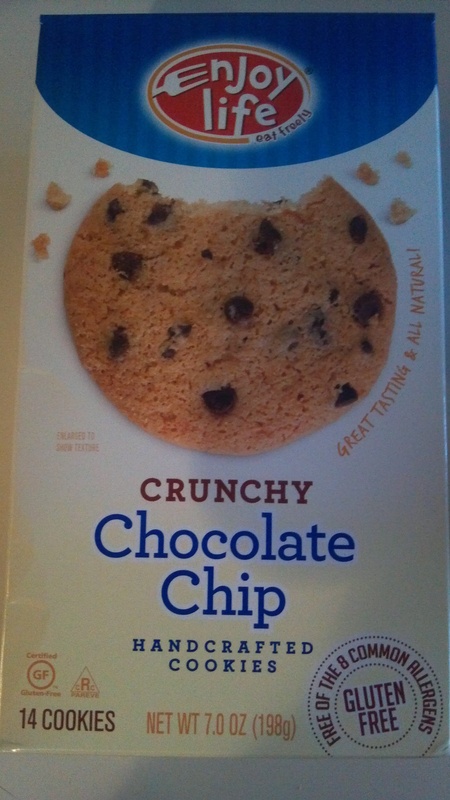 But sometimes, even in a ‘eat real food’ diet, I just want to go to the store, buy a box of cookies and eat them all. 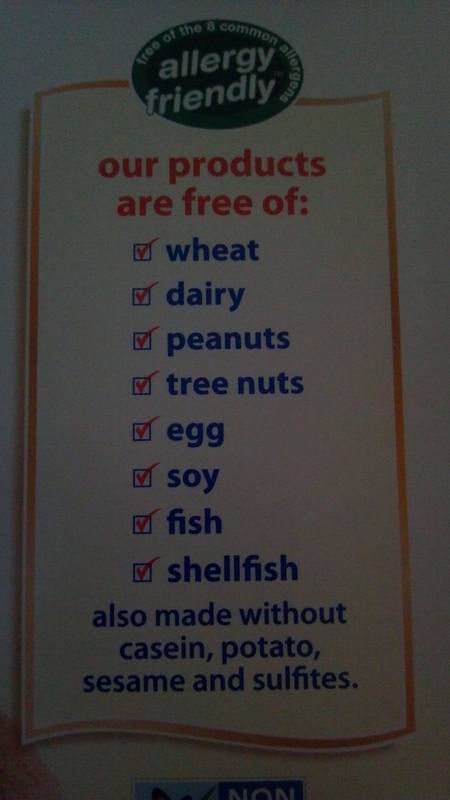 A few weeks ago I discovered ‘Enjoy Life’ brand products which are ‘common allergy free’. I’ve been eating their ‘chewy chocolate chip cookies’ and they were pretty good, but I really love crunchy chocolate chip cookies. And then I discovered these. 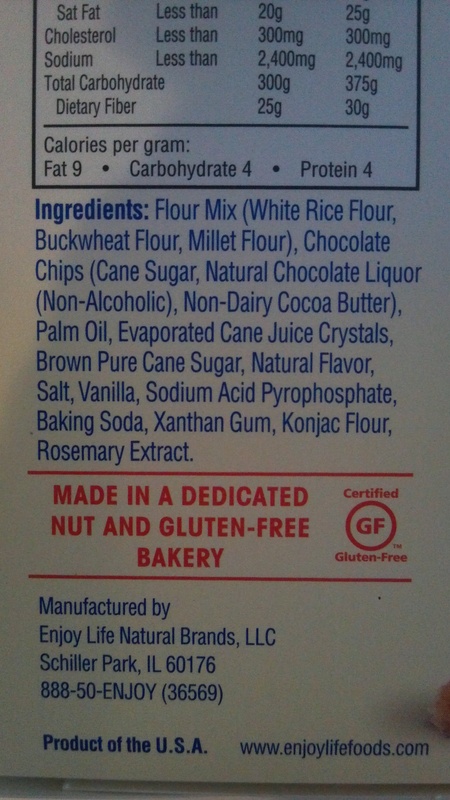 And the ingredients are pretty awesome for cookies, that is. So right now, me and my sore body parts are going to sit on a heating pad, and eat cookies. What’s your favorite ‘manufactured but not terrible’ snack food? Pingback: Chocolate Chip Cookies [To combat the weeknight blues.] [Vegan/Gluten Free] | Make them whole foods. Make them delicious. And make sure you feel great eating them.